This downtown bus stop and shelter has been closed since August and won’t be reopened when the Broadalbin Street sidewalk widening is done. The public transit bus shelter is still there, but buses are gone from Broadalbin Street because of the downtown Albany streetscape project. And replacing the downtown stop with two others will eventually remove some on-street parking from Ellsworth and Lyon Streets. Wandering around downtown on an idle afternoon this week, I was reminded of the bus service changes made necessary by the $8.5 million project to revamp the code area sidewalks and streets. 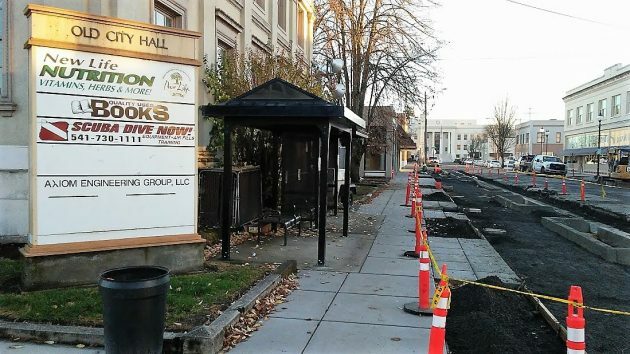 When the Broadalbin bus shelter in front of the old city hall was closed in August, it was replaced by a temporary stop, without bench or roof, on Washington Street in front of the post office. 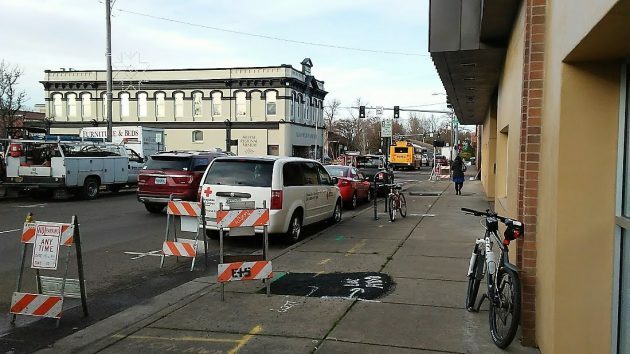 Earlier this month, the city council was briefed on plans for a permanent solution once the streetscape job is done next year. In short, the plan is to have two bus stops downtown, one each on opposite legs of the Highway 20 couplet. One will be on the west side of Ellsworth near City Hall, and this will include a shelter. The other one will be on the east side of Lyon, in front of the office of Linn County Parole and Probation. The city plans no shelter there because the building has an awning that sticks out two or three feet over the sidewalk. The new bus stops on busy Highway 20 will eliminate on-street parking spaces, five on Lyon and two on Ellsworth. The awning here will take the place of a shelter at the location of a planned Lyon Street bus stop. Your kidding me about a bus stop in front of P & P! So it has an awning. It’s the same location the “cons” hang around to smoke while waiting to report in. The City would have my family wait in their presence & a smoking smell for a bus!! I’d say move the proposed site up or back a block. The true tragedy of the downtown “renewal” foisted upon the electorate by those who should know better, is that all the curb-jockeying and tree-planting and bus-stopping changes do the one thing that Albany does not need. All this downtown historical revisionism and supporting aging infrastructure is backwards-looking at the precise moment in time when Albany has an opportunity to be forward-looking. No amount of historical restoration will turn Albany into some tourist Mecca. Oregon is a tourist backwater. You could plant a Redwood Forest up and down Ellsworth and it would make almost no difference. The City needs to focus on the future and the opportunities still to come. Albany would do better to offer free computer and IT courses at LBCC, bringing in the young talent needed for the 21st century. Spending monies to upgrade the facade of 19th century storefronts is all well and good. But if you don’t have gigabit optic fiber going into those old shells, and some job opportunities reflecting the current society, then the CARA vision of Albany’s downtown will be akin to “Old Tucson,” a faux Western town in Arizona where John Wayne gunned down the bad guys before heading to the saloon. Comcast would definitely sue Albany if they tried to set up their own internet service. They don’t like competition. At the very least, there ought be a free bus headed toward LBCC every 30-minutes so that the students interested in the LBCC Up-ticked IT/Computer/Drone/AI programs being offered by that august organization. Use the Pepsi Plant holdup dough to get things rolling. It makes me crazy (or crazier!!) to look at or read about downtown Albany. If city is sincere about their big boom expected in retail from the carousel and all their street work, why in the heck are they being stingy on getting bus shelters up, even if they are temporary? Also, Hasso, has downtown Wells Fargo started letting non-banking customers park in their lot? I can’t believe it; if it is true, that would be a good thing. I noticed all the cars in the lot so drove through it and couldn’t see any “bank customers only” signs like they used to have. I hope they are letting the public park there. The city is whittling away at parking spots, so the parking is needed. And, banks don’t have the walk-in customers they had 30 years ago or so when old buildings were razed in order to build that Wells Fargo lot.